Scientists say they’ve isolated what appear to be red blood cells and other microscopic bits of soft tissue from several 75-million-year old dinosaur fossils, using a technique that could revolutionize the study of ancient animals. What’s more, they say, the fossils were not particularly well preserved, suggesting that dinosaur soft tissue may be found more readily than was previously thought. “We didn’t go into this study looking for soft tissues,” said Dr. Susannah Maidment of Imperial College London, a co-author of the study. 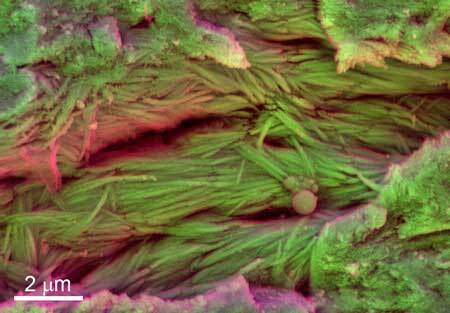 “In fact, we were just looking to see what we could see if we looked at dinosaur bone at the nano-scale. 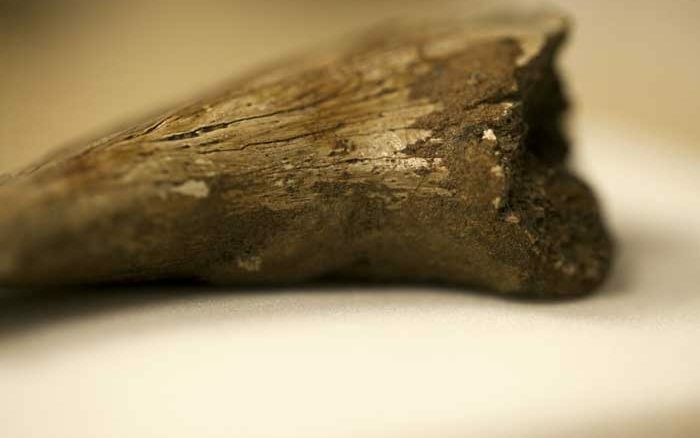 Dr. Maidment and her colleague, Dr. Sergio Bertazzo, used electron microscopes and mass spectrometers to analyze eight fossils from the collection of the Natural History Museum in London, beginning with the claw of an unspecified theropod from the Dinosaur Park formation in Alberta, Canada. A microscopic analysis of the claw turned up structures that closely resembled red blood cells, she said, including ones with their nuclei still intact. “We decided to see whether this was a ‘one off’ or whether we could find other fossils that had blood cells and soft tissues,” she said. After studying seven more rib, foot, and leg bones from hadrosaurs found in Alberta and Wyoming, the researchers discovered even more red blood cells, along with fibers of collagen, the protein that forms the matrix on which bone minerals are built. “We have several indications that the structures we found are consistent with red blood cells and collagen,” Bertazzo said. The pair made many of their discoveries while examining the fossils with a microscope equipped with what’s known as a focused ion beam, Bertazzo said. “This is a special microscope equipped with a beam of heavy atoms that can make small cuts in the sample at nanometric scale,” he said. “The same microscope also has a robotic arm with a micro needle that can be used to pick up and move things inside the microscope. “So, combining the beam and the needle, we could cut small bits of the fossils and perform an analysis to check for any fragment of amino acids,” which are the building blocks of proteins. In all, researchers found soft tissue in seven of the eight samples. They added that they did not find any evidence of DNA in any of the cells, but their methods could eventually be used to help identify specific types of dinosaurs, and provide insights into how extinct dinosaurs relate to modern animals, particularly their living descendants: birds. Strands of collagen, for example, contain patterns of tiny bands that are unique to certain sets of animals, like a “fingerprint,” Maidment said. “Two closely related animals will have more similar collagen than a less closely related one,” she said. 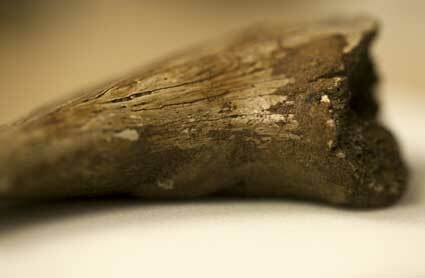 This is the first time such bands have been detected in dinosaur bones, a “very exciting” discovery, she noted, since it was generally thought that proteins degraded beyond this level of detail after about 4 million years. “So if we were able to extract and fingerprint the collagen in the future, this would give us an independent line of evidence about who is related to whom in the dinosaur family tree,” Maidment added. And yet, Maidment added, the dinosaurs’ blood cells were also markedly smaller than those of modern emus — less than a quarter of the size. This, too, is potentially important, she noted, because the size of an animal’s red blood cells correlates with its metabolism. So these clues could help solve the mystery of whether dinosaurs were warm-blooded, cold-blooded, or something in between. “There is a very well known relationship between red blood cell size and metabolic rate: The smaller the red blood cells, the faster the metabolic rate,” Maidment said. “The ancestors of the dinosaurs are generally thought to have been cold-blooded, while their direct descendants, the birds, are warm-blooded. “This means that somewhere on the evolutionary lineage to birds, within Dinosauria, warm-bloodedness evolved. “If we could find red blood cells in a whole range of different dinosaurs, we could examine the cell size and provide an independent line of evidence to examine which dinosaurs were warm-blooded, and therefore perhaps more bird-like in their lifestyles, and which were cold blooded, and perhaps more reptilian. Ultimately, it’s potential future applications like these — rather than the findings from the Alberta and Wyoming fossils themselves — that make this research so potentially important, the pair noted. Improving on their techniques in high-tech microscopy could change how scientists study bones from the distant past, and may eventually help solve some of the deepest mysteries about extinct dinosaurs. “What is most exciting for me is the potential this opens up,” Maidment said. “If we are able to find these tissues in other specimens, and replicate the results, it indicates this type of preservation might even be the norm. Maidment and Bertazzo report their research in the journal Nature Communications.